What are some good healthy snacks and foods with protein to have on hand that my teens and tween can eat on the go? For the trail mix, Melanie suggests using what you have in the pantry, get creative with ingredients and allow your children to help make the recipe. https://feedtosucceed.com/wp-content/uploads/2018/09/Screen-Shot-2018-09-25-at-11.16.57-PM.png 694 1150 feedtosucceed https://feedtosucceed.com/wp-content/uploads/2013/04/fts_logo2-300x138.png feedtosucceed2018-09-26 04:17:552018-09-26 04:17:55Ask Amanda: Bigger Kids and Snacks – What’s a Good Choice for On the Go? This week’s Ask Amanda focuses on what is the difference between the food for adults and food for kids/toddlers over 11 months. This is a great question! The answer is – there should not be too much difference. Toddlers need what we need – just in smaller amounts. 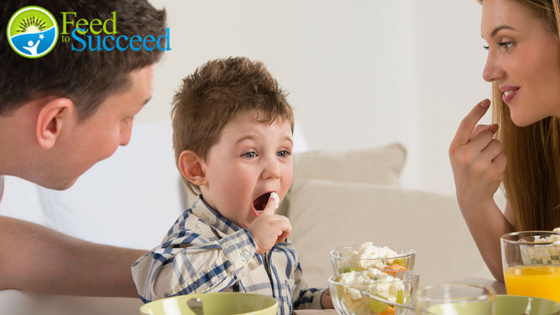 Unless there is a medical or developmental need to offer or prepare separate foods, toddlers can eat just about the same foods as grown-ups. Toddlers may have some chewing limitations that can limit textures and choking hazards, but in terms of the variety of foods, everything is fair game! Toddlers need the same foods to fuel their growing bodies that we need – just in smaller quantities. Like adults, toddlers need fruits, vegetables, meats or other lean protein sources, breads or cereals or starches, and fats and oil. We used to suggest waiting to introduce potentially highly allergenic foods to toddlers, but this science is also rapidly changing. A toddler’s total calorie or energy needs per day are less than adults though, impacting their daily portions. Typical toddler portions for a day are: 2 servings of dairy (1 serving is 1 cup of milk or yogurt or about 1.5 oz of cheese), 1.5 oz per day of meat or other lean protein, 2 oz per day of breads, cereals or other starches like pasta or rice (try to make these whole grain choices), 1 cup a day of fruit, ¾-1 cup a day of vegetables, and some fats and oils. Season 2 Finale: That’s a wrap! Bob’s Red Mill vs Pillsbury flour – which is better? What did Jen learn most from season 2? Is your child secretly a good athlete, but no one knows it because they never hydrate? Listen to the final episode of season 2 as Jen and Betsy discuss their favorite season 2 topics, plus delve lightly into kids’ sport nutrition. Hear a sneak preview of things to come in season 3, and be sure to tune in to the season 3 Facebook Live debut, date to be announced soon! https://feedtosucceed.com/wp-content/uploads/2018/09/Screen-Shot-2018-09-16-at-10.51.28-PM.png 786 1184 feedtosucceed https://feedtosucceed.com/wp-content/uploads/2013/04/fts_logo2-300x138.png feedtosucceed2018-09-17 03:52:332018-09-17 03:52:33Season 2 Finale: That's a wrap! As a parent, how do you know if you should reach out and request an EI evaluation? In order for your child to qualify for these services, they need to be under 3 years of age and either have a developmental delay, or a condition (genetic defect, premature birth, hearing loss, birth defect, etc) that can lead to a developmental delay. If you have concerns regarding your child’s development or nutritional status, you can use the DHS Office Locator and contact the “Child and Family Connections” office in your area. You will be placed in contact with a Service Coordinator (SC) who will help organize evaluations for your child. The various providers can include a speech-language pathologist (SLP), occupation therapist (OT), physical therapist (PT), developmental therapist (DT), social worker (SW/LCSW), registered dietitians (RD), audiologist, and vision specialist. Once the therapists have completed their evaluation of your child, they will either recommend services for your child, or not. These services, most of the time, take place in your home. If your SC cannot find a provider for a services that your child qualifies for, in your area, the service can be completed in an office setting. For example, if your SC cannot find a dietitian in your area to have ongoing services in your home, insurance/the state will pay for these sessions to take place in our office in Glenview. Ongoing services can be anywhere from a couple times a week, to once a month. These services will continue until your child turns three, or until the provider feels your child no longer has a delay in that specific area. If you have any additional questions, please feel free to reach out to Gia@FeedToSucceed.com. With back to school behind us and cooler evenings upon us, we are thinking about fall eating! Cinnamon apples, pumpkin pies, pears and squash are amongst our favorite fall delights. Join Betsy and Jen as they update their listeners to the late-season garden, what’s good now in seasonal produce and ideas to get your family interested in trying some of the less-interesting fruits and vegetables currently available.